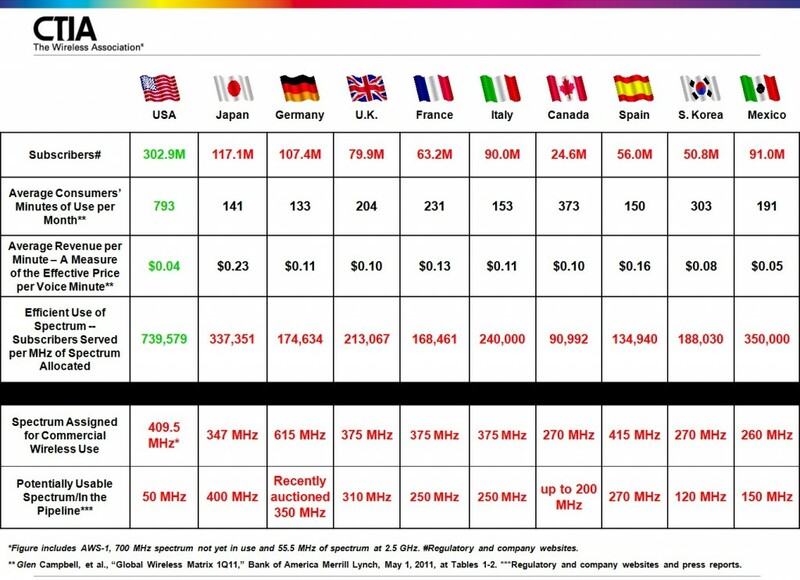 Dubious spectrum efficiency metric won’t die « Steven J. Crowley, P.E. In the FCC’s incentive spectrum auction proceeding, Information Age Economics (IAE) complains about the reliance of some in the industry (CTIA and Verizon, to name a couple) on a spectrum efficiency metric that simply divides an operator’s nationwide spectrum holdings by the number of subscribers. This results, in one example they give, of Sprint having 3.57 Hz per subscriber and Verizon having 1.05 Hz per subscriber. Some take this as Verizon using spectrum more efficiently, and perhaps being at a disadvantage. As IAE points out, however, spectrum is not partitioned to users this way: cellular infrastructure allows for frequency reuse. If one wants to compare the spectrum efficiency of Sprint and Verizon, don’t look at it nationwide — look at, say, Washington, D.C.
Canada is less than one eighth as efficient as the U.S. and Mexico is over 3.5 times more efficient than Canada. Mexico is almost twice as efficient as Germany. India is over 60% more efficient than China, which is itself over three times more efficient than the U.S., and China Mobile is similarly over 3 times more efficient than Verizon. India is over 11 times more efficient than Japan. This entry was posted on Wednesday, May 29th, 2013 at 11:25 am and is filed under Auctions, CTIA, Spectrum. You can follow any responses to this entry through the RSS 2.0 feed. You can leave a response, or trackback from your own site.